Through this camp, we will learn traditional mbira and drumming and chipendani. Further, students will be able to seek spiritual help and healing in the rural area of Chiweshe. This is a wonderfully unique experience, hosted by Zimbabweans, and consisting of music steeped in Zimbabwe’s rich cultural and spiritual history. The camp will be accessible to beginner and intermediate players, while advanced players will be given extra instruction and challenges. Each guest teacher will spend between 1-2 days at the camp. The daily schedule will consist of learning a kushaura and a kutshinhira in the morning, then learning the accompanying singing in the afternoon. 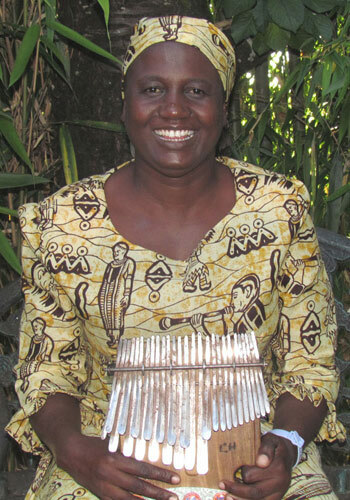 Between mbira and singing, there will also be hosho and dance lessons. In the afternoons, students will have the choice of resting, shopping, and visiting nearby places. In the evenings, students will play together, and will have individual instruction with the guest teacher. Patience will further assist in the teaching of mbira and singing. There will also be several cultural talks, offering insights into Shona customs, beliefs, and language. One day will be devoted to learning traditional drumming in Chiweshe. The fee for the full camp is $1850, which includes a new mbira, accommodations, food (three meals/day – vegetarian option available), workshops, cultural excursions, and donations toward the sacred ceremony. Internet access will be available. We can make arrangements to pick you up from the airport and take you to Kufunda Village, but you will need to pay for this separately (about $30). A $500 deposit for the camp is required by November 15, 2018. Full payment is due by January 1, 2019. Please see application form below for details. This is a safe time to travel in Zimbabwe. I will be happy to answer any questions you may have about what to bring, etc. Updates will be posted on the Facebook event page Camp Nharetare 2019 with Patience Munjeri in Zimbabwe. I look forward to seeing you in Zimbabwe!